As of now, every application or tool which promises free calling is based on the Internet: You choose the application, install it and use VoIP to make free call. But an Indian startup is trying to change the equations over here, as they have introduced a novel concept wherein any mobile user would be able to make free calls, even without Internet. 2 What is the catch? 3 Who is behind Freekall? Call at 080-49202060 after which the call will drop. You will receive a call on your number. Pick up the call and dial the number on which you want to talk and you will be connected to that number. Freekall founders are trying to implement a monetization method based on advertisements. 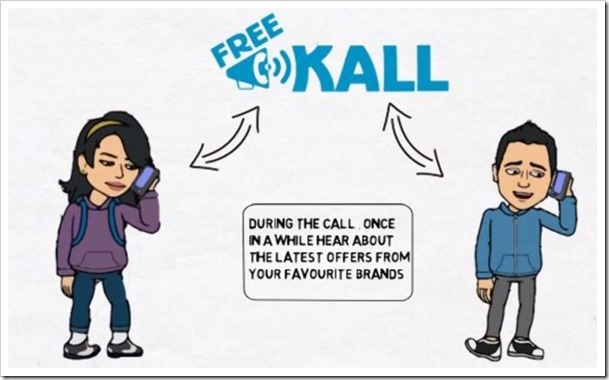 In between the free calls, you will have to listen to an advertisement where the brands will pitch their products. These 10 seconds ad will be the base on which Freekall is able to offer you free calls. The beauty of the idea is that you are not even required to register with them to use this service. Simply call their number and start calling free with their 10 second advertisements in between the calls. Unregistered users will get 3 minutes of free call every day, while registered users will get 12 minutes of free calling, every 24 hours. Once the beta phase is over, registered users will get unlimited amount of calling minutes. The team behind this Cloud based Telephony startup are Yashas C Shekar, Vijayakumar Umaluti and Sandesh E, who are based in Bangalore. They have been working on this idea for the last 8 months. Freekall has received a seek funding of Rs 10 lakh from Ranjit Cherickel, founding member of 88mph, an Africa-based accelerator program platform. The concept is definitely unique in terms of how it provides free calls with out need of having internet connectivity. The service may find appeal with college going kids, who are always short on balance on their pre-paid cards. Obviously, very few will use it as the primary method. But, it can work really great in case of an emergency when you have no balance and want to make a call. One aspect that all users need to keep in mind – confidentiality. Your calls are getting routed via Freekall network, so there is always a chance of your privacy getting compromised. What are your opinions on this new idea? Please share your views by commenting right here! "Freekall.in Allows You To Make Free Calls Even Without Internet", 5 out of 5 based on 1 ratings. Its a novel idea, no doubt about it. But I am struggling to see incentive for the people who will be using this medium. Just feel that an audience that is looking to get everything for free isn’t an audience that big game advertisers will really be interested in or maybe they would baulk down after seeing that this audience may not convert. Maybe that is an assumption but I definitely believe that this could very well be the case. Nice Initiative! Best of luck! Thanks for sharing about this service. Yes, students will surely use this service a lot. I can just give one suggestion. That rather than calling to the landline number of bangaluru mentioned in step one, They should keep a Toll-Free number. So that students will not hesitate to do the first step. Otherwise many users will think that they will have to atleast pay for the initial call to the landline number. If you are paying anything then its not for free. I hope that this suggestion will help them to improve their service. I wish them all the best for implementing such a kickass idea. @Nikhil I do agree with your suggestion. They need to have Toll-Free otherwise it is obviously not a free service as users will need to make a call from their phone. I am sure the founders may have given a thought to it, and may be implementing it soon..
Hi Nikhil.. Yes, very interesting suggestion. But as Arun shared, toll free must be in their agenda.. They have just received a seed capital of Rs 10 lakh, and hopefully, they will do everything to make this service more affordable. But the 10 sec ads in between the calls takes the charm away from the service.. I mean, imagine you are talking with your friend regarding plans for going for a movie, and as soon as you try to share the location of the movie theater.. there comes in an advertisement! As mentioned in the post, in times of emergency, and some occasions, this service may prove to be beneficial..